PRICE ON APPLICATION, DEPENDING ON CHOICES AND QUANTITY. INCLUDED IN WEDDING PACKAGE Trained & Uniformed Staff to set up Decorated Banquet Table, Tray Service Appetisers, Carve, Serve the Bridal Table, assist Guests with the Buffet, Clear Tables after Each Course, China Plates & Stainless Steel Cutlery, Colour Coordinated 2ply Dinner Napkins, our famous Rich Brown Gravy, a full range of Condiments, and Disposal of all Food Waste. Optional: $2.50 extra per person. Atlantic Salmon: Whole Sides of Fresh Atlantic Salmon, Dusted with a touch of Cajun Spice, Baked, Chilled, Sprinkled with Lime Juice served with Sour Cream and Dill. A Premium Cut Beef, coated with a moderately Spicy Pepper Crust and Roasted to Perfection. Tender Juicy Boneless Lamb carved for your guests. Steaming Jacket Potatoes, Basted in Garlic Herb Butter with a sprinkling of Paprika. Whole Pumpkin, Seasoned with Breadcrumbs, Onion, Egg & Herbs, and served Direct from the Carvery. Crispy Cos Lettuce Tossed with Bacon Pieces, Eggs, Croutons, our own Special Caesar Dressing and Topped with Fresh Parmesan Cheese. Sliced Roma Tomatoes & Baby Bocconcini Cheese in a Spiral Design, Decorated with Fresh Basil & a Sprinkling of Balsamic Vinegar. Pasta Spirals, Carrot, Onion, Capsicum & Corn in a Light Italian Dressing. Filled with Sliced Fresh Seasonal Fruits and Decorated to Perfection. 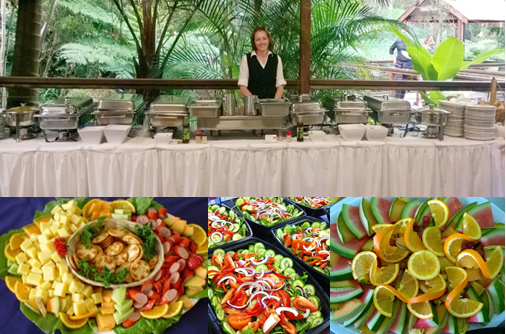 Trained and Uniformed Staff to Tray Service Appetisers, Set Up Decorated Banquet Table, and Tea & Coffee Station, Table Service to the Bridal Table, Carve, Serve &, Assist Guests with the Buffet and Clear Tables after each course. Freshly Baked Bread Rolls & Butter, Gravy, Condiments, China Plates, Cups & Saucers & Stainless Steel Cutlery, Colour coordinated 2 ply Disposable Dinner Napkins and Disposal of all Food Waste. A Unique and Delightful Cocktail Selection! Includes trained, uniformed staff to Tray Serve your guests. We will provide our own preparation tables and mobile gas oven so that each course will be served freshly prepared and hot where appropriate. We will provide small china plates and finger bowls for the Seafood Platters. Includes colour co-ordinated Napkins to suit your scheme. We will clean and remove all waste. A Gourmet Greek Delight with Kalamata Olives, Sundried Tomatoes, Fetta, Pickled Onions, Artichokes on a bed of Lettuce. A Chilled selection of Fresh Seafood, including Smoked Salmon, King Prawns, Oysters on the Shell and Baby Octopus, served with lemon and Tartare. Warm Petit Baguettes filled with slices of Ham Off the Bone, Tasty Melted Cheese and Seeded Mustard or Basil Pesto, Sundried Tomato & Parmesan Cheese. A delightful assortment of Freshly Made Sushi, served with Soy and Wasabi dressing. Can be Vegetarian or Mixed Choice. Includes trained, uniformed staff to tray serve your Guests for one hour as an Appetiser before the Main Course. We will provide our own preparation tables and mobile gas oven to serve your menu fresh and hot. We will colour co-ordinate the napkins and clean and remove all waste. Please select 4 choices and we will allow 5-6 pieces per person. Traditional Italian Diced Tomatoes & Onions, combined with Selected Herbs & Spices & Topped with Grated Cheese. Can be served Hot or Cold. A Selection of Bacon, Egg & Onion,Cheese & Spinach or Tomato & Mushroom Fillings in a Petite Butter Pastry Case, served Hot. Bite-Size Balls of Lean Minced Beef & Selected Herbs & Spices – chargrilled to enhance the Flavour. Delicious Savoury Fillings in Petite Vol au Vent Puff Pastry Cases, oven baked. Finely Shredded Prawn Meat spread on Small Fingers of Toast, coated with Sesame Seeds & oven baked till Golden Brown. Assorted fillings of Spinach & Fetta, Olive Tapenade, Smoked Salmon, Ham & Seeded Mustard, enclosed in a light Puff Pastry. Butter Croissants filled with Leg Ham, Cheese and Seeded Mustard.